Novel South Capitol is a new luxury apartment complex that includes ritzy amenities such as a coworking space, a dog park with a watering station and play area and an on-site cafe that's coffee shop by day and cocktail bar by night. See photos. 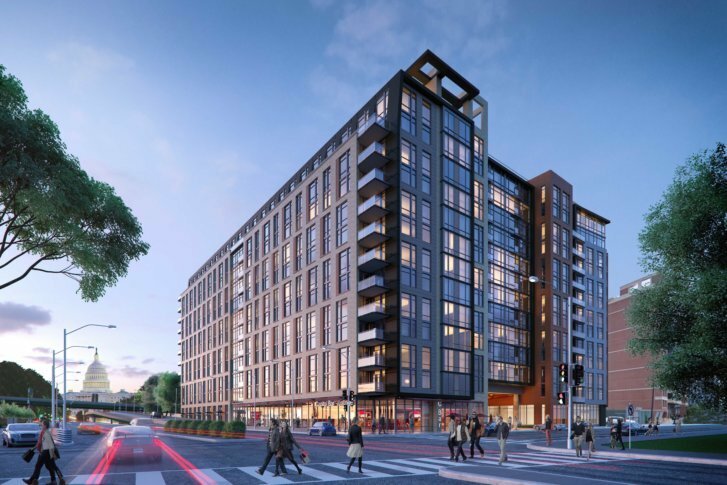 WASHINGTON — Novel South Capitol, a new luxury apartment development sandwiched between Capitol Hill and Capitol Riverfront, with an on-site coworking space, has begun leasing with first move-ins expected in February. The 539-unit apartment building, at 2 I Street SE, has 42 penthouses and includes studio to three-bedroom units from 500 square feet to 1,800 square feet. Rent ranges from $1,777 to $5,652 a month. What residents get for that kind of rent includes social amenities like an on-site cafe that serves as morning coffee shop and evening cocktail bar, drive-in courtyard with two-level waterscape and a shared coworking center with conference rooms. Per new luxury construction in D.C., there is also the requisite rooftop pool (this one with ballpark and Capitol views), a dog park with a watering station and play area, an on-site fitness suite with a yoga room, a clubroom with billiards, 24-hour concierge services and car charging stations as well as lockers for packages, refrigerated lockers and dry-cleaning lockers. It is the first of two towers. The second tower is expected at the end of 2019. Ground was broken on the 13-story project in February 2017. Crescent Communities and RCP Development Company are marketing Novel as a bit of a rebel in D.C.’s recent crop of new luxury apartment developments with what it calls principals of inclusivity and a neighborhood philosophy as a place for both residents and its neighbors. It may also appeal to residents who want to blur the lines between work, recreation and home with its social spaces and extensive coworking facilities. “With a distinct emphasis on experience and lifestyle, Novel South Capitol will deliver the next phase in elevated apartment living,” said Steve Etminani, founder of RCP Development. Novel South Capitol is at the corner of I and South Capitol Streets in Southeast, about three blocks from the Navy Yard-Ballpark Metro station. Take a look at Novel South Capitol floor plans, some with balconies and many with Capitol or ballpark views.